Some of my friends surprised us on our anniversary last month with a cake. It is such a great thing to take out some time from our busy schedule and have fun with friends, at the same time making someone feel very special. One of my friends had her birthday last week. We decided to surprise her by showing up at her place with a cake and food. Since she is a vegetarian, I decided to bake an eggless cardamom cake. I am little bit intimidated by eggless cakes. I usually bake cake with eggs, somehow I feel the eggless cakes become more dense. Whenever I have to bake an eggless cake, I usually bake date cake. I have baked this for my friends many times, so I wanted something different. 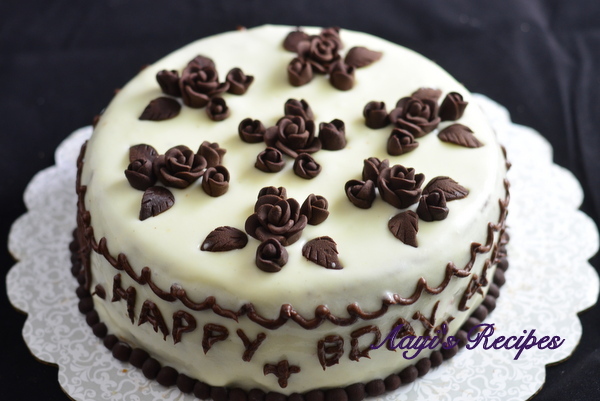 When I was looking for the recipe, I came across Madhuram’s eggless vanilla cake. It looked very interesting. from there, I got to the original recipe from AllRecipes. I followed that version mostly with some minor modifications. As mentioned in many comments there, I used cake flour – all purpose flour + corn starch mixture. I replaced vanilla with freshly ground cardamom. The aroma of the cake was divine. When it was baking, my entire apartment filled with sweet cardamom aroma. The cake was not too fluffy like a cake with eggs, but it was soft and very tasty. 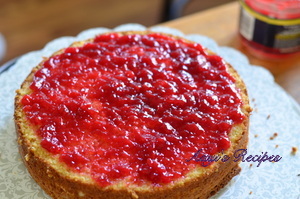 I added a layer of strawberry jam in between two layers of cake for some extra taste. 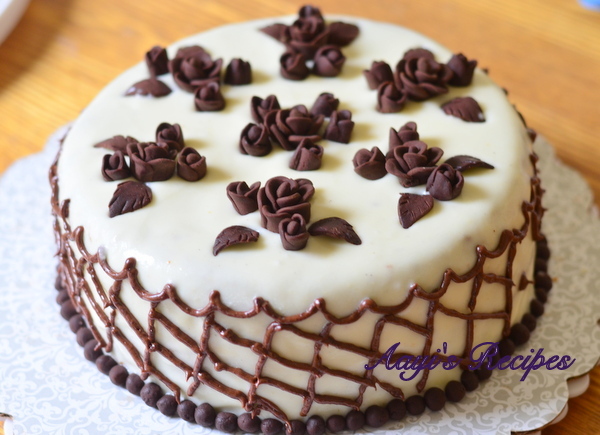 I used cream cheese – butter frosting to decorate the cake. Instead of using the whole milk, I added cream. I also added a pinch of cardamom powder to the frosting. The frosting tasted so great and went well with the cake. I made the chocolate flowers and leaves using modeling chocolate. 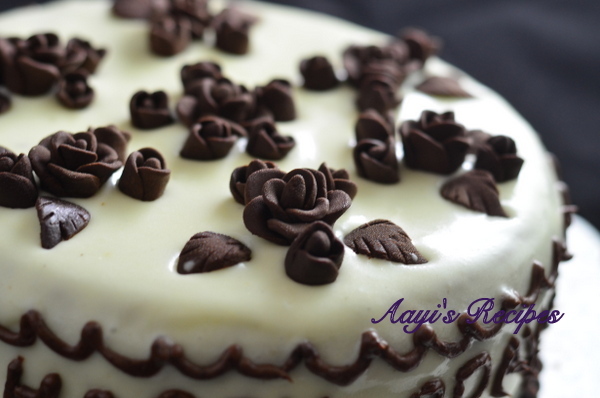 The recipe and method to make the modeling chocolate and roses can be found at Veena’s art of cake. (OMG, I am in love with that site, just check out all her tutorials!. I have learned so much from her in last few weeks). I mixed some of that melted modeling chocolate and mixed with frosting to write Happy Birthday on the cake. My friends loved the cake. My efforts paid off. A big hats off to my 4 month old to let me work on the cake!. Peel and powder cardamom. Sieve together all purpose flour, corn flour, baking soda and baking powder. Take butter, orange juice, condensed milk and cardamom. Beat well to mix. (It is a good idea to beat butter first and then add other things to avoid splattering!). Then slowly add the flour mix a little at a time and mix well. Add the batter in a greased pan. The batter is pretty thick, but it will bake beautifully. Bake in preheated oven. Let the cake cool and then cut horizontally. Spread some strawberry jam in between(optional). Keep the top layer. Make the icing and decorate the cake (optional step). Preheat oven at 350F for about 10mins. Grease a baking dish with butter and flour, keep aside. Sieve together dry ingredients - cake flour, baking powder, baking soda and keep aside. Take condensed milk, orange juice, cardamom powder, butter in a bowl and beat till mixed. Add the flour mixture a little at a time and mix till combined. Bake at 350F for about 40-45mins till a tooth pick inserted in the center comes clean. You did a lovely job decorating that cake. The cake recipe sounds really scrumptious, too! Just tried this today. Amazing. People couldn’t believe this cake was eggless. It’s a keeper.